Westside Athletic club is excited to open a new Pilates Studio led by Gia Palacorolla. Gia is teaching beginner and intermediate pilates mat classes. She is also available for private instruction. Preserving the classical, historical Pilates method of Body Conditioning (also known as Contrology) as originally intended by Joseph H. Pilates! Based on an ordered sequence of exercises, which are characterized by breath, flowing movement, technically correct execution, and taught with strong awareness of rhythm and dynamics! It is recommended, but not required, that students new to Pilates attend at least 3-5 sessions of Healthy Foundations first to be introduced to the Classical Beginning Mat series. Private Pilates instruction is customized for clients goals and level of fitness. 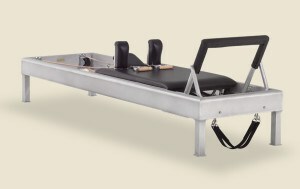 May include mat and reformer work along with other apparatus as needed. Part scientist, mechanical genius and anatomist, Joseph Pilates created a movement system he coined “Contrology,” accompanied by a variety of equipment that he referred to as “Apparatus.” The Apparatus was designed to help accelerate the process of stretching, strengthening, improving body alignment and increasing core strength started with mat work. 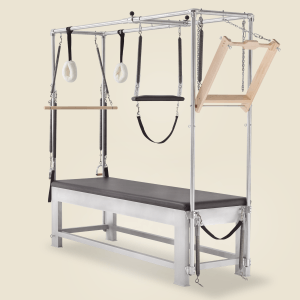 The best-known and most popular apparatus, the reformer, was originally called the Universal Reformer, aptly named for “universally reforming the body.” The full complement of equipment and accessories designed by Joseph Pilates, include the Cadillac, Wunda Chair, High “Electric Chair”, Spine Corrector, Ladder Barrel and Ped-i-Pole all of which will be a part of the Pilates Studio at WestSide Athletic Club! Seventy-five percent of the Pilates repertoire is performed on the reformer and mat, while other pieces are used for creating a balanced workout and addressing the individual needs of a student. The Universal Reformer, known as the reformer, is the most popular piece of equipment and one of Joseph Pilates’s original inventions. He believed beginning exercise in the horizontal plane was important to relieve the stress and strain on the joints, and to align the body before adding additional gravitational forces through the central axis while standing, sitting or kneeling. Classically, there are more than a hundred movements created for the reformer, each dependent and built upon the other.